Recently one of our readers asked if it was possible to duplicate a WordPress page with a single click? 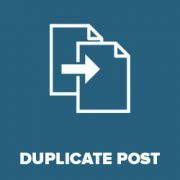 Creating a duplicate post or page allows you to work on it without affecting the existing version. 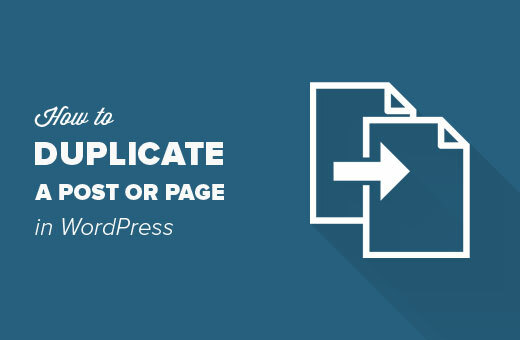 In this article, we will show you how to quickly duplicate a WordPress page or post with all the settings. Why Clone or Duplicate a Page / Post in WordPress? When working on a website redesign, you may want to copy and paste the content of an existing page to make tweaks. While you can edit a page and copy / paste all its content into a new draft, none of the other elements such as featured images, SEO data, page templates, etc would move over. That’s when having a duplicate page feature in WordPress is really handy. 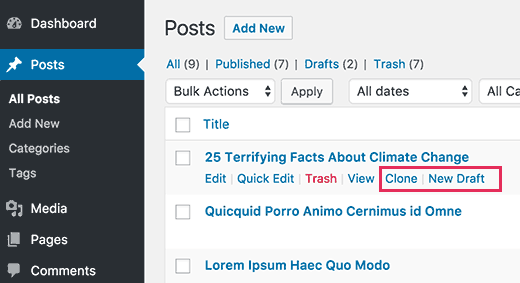 Similarly for posts, you may need to work on older drafts and published posts on your WordPress site. You can just edit a post and start working on it. However, this may not be an ideal situation in some cases. For example, some other author may be working on it, or you may want to keep both drafts. Let’s see how to easily clone a WordPress post or page with just a click. First, you need to install and activate the Duplicate Post plugin. For more details, see our step by step guide on how to install a WordPress plugin. Upon activation, you need to visit Posts » All Posts page. You will notice two new links to clone or to create a new draft below each post title. Clicking on ‘Clone’ will simply create a duplicate post and will not open the duplicate post in the post editor. The ‘New Draft’ option will duplicate the post and open the duplicate version in the post editor so that you can start working on it right away. You will also find the same options for pages as well. The duplicate post plugin works really well. However, if you want to use it mainly for updating old published posts, then there is a better way to do that. See our guide on how to properly update live published posts in WordPress for more details. If you want to use it for other scenarios such as website redesign and pages, then this is a solid solution. 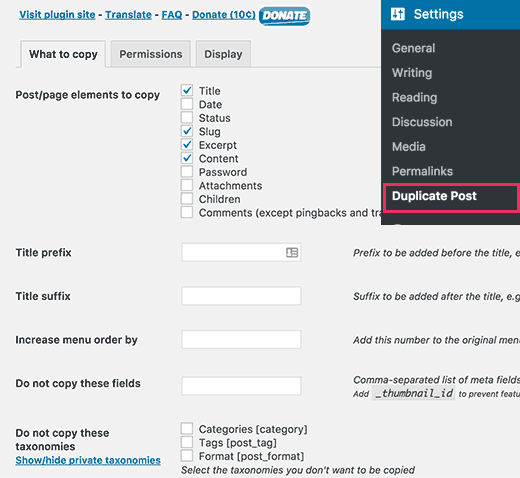 The duplicate post plugin works out of the box and supports posts and pages by default. 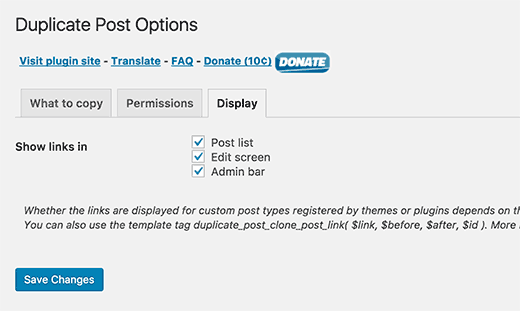 You can also customize the plugin to enable support for custom post types, restrict to user roles, and choose what to copy when creating a duplicate. Let’s take a look at all these settings. Head over to Settings » Duplicate Post page to configure plugin settings. The settings page is divided into three tabs. First tab allows you to choose what to copy when creating a duplicate. The default options should work for most websites. However, you can check things you want to copy and uncheck items that you don’t want to be copied. Next, you need to move on to the permissions tab. 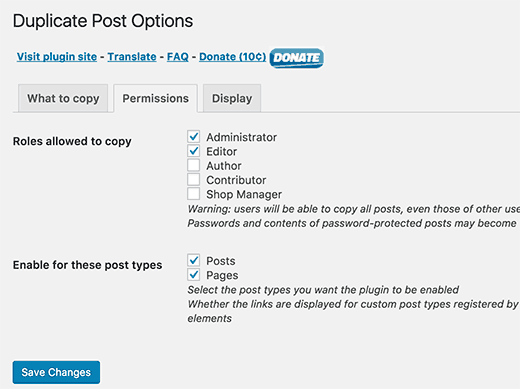 By default, the plugin allows administrator and editor user roles to create duplicate posts. It also enables duplicate post feature for posts and pages post types. If you are using custom post types on your website, then those post types will appear here. You can choose whether you want to enable duplicate post feature for those post types as well. Finally, click on the display tab to choose where you want to display the clone post links. By default, the plugin shows them on post list, edit screen, and admin bar. That’s all, we hope this article helped you learn how to easily duplicate a WordPress page or post. You may also want to see our ultimate WordPress SEO guide for beginners to improve your SEO rankings. Thank you for this post–It was just what I needed! I went from I wonder how I can….to duplicating a post in a matter of minutes! Is there a way to copy a post and paste it in Word, for eg, so you can save the wording for use elsewhere? Great Thanks for your work on this. It helpt me great. I,m a beginner with wordpress and try to figure it al out I,m trying to work whit Elementor also great but this whas missing. Once the duplicate is edited, how do you then replace the original that is live? It seems like it would be a lot of steps. – Rename the duplicate to match the original. – create a new menu item, pointing it to the new edited version. – delete the menu item pointing to the original version. Thanks for the info. What I want to be able to do is rename the Duplicate/Clone page, so it is found in Searches (and at the bottom on my website). Can you give me some guidance please. how can I duplicate a page to an existing page. After you’ve used the plugin, is it safe to uninstall? Yes, you can uninstall the plugin after you have duplicated the content you needed. Very easy to follow and helpful video. Thank you! Thank you. A very quick and helpful solution. That’s why is WordPress the most used platform! Thanks for sharing. Really like the site redesign. Hi Naveen, thanks for the feedback.